Today shots of an early spring flower, Dandelion - Taraxacum officinale in reflected ultraviolet photography. Lens was a CERCO 94mm quartz fluorite lens. Light source was sunlight. All shots were done in reflected ultraviolet photography using my "work horse" UV filter, the Baader-U filter, as well as my XBV6 filter for simulated bee vision. Lens was a CERCO 94mm quartz fluorite lens. Light source was sunlight. All shots were done at about f8. This Dandelion flower has quite a prominent UV pattern, its petals are UV bright around 365nm, its center is UV dark, especially the anthers, and this gets quite nicely visible, also in simulated bee vision. 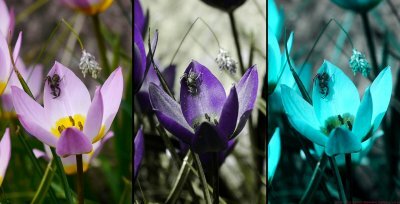 Today shots of a Cretian Rock Tulip - Tulipa saxatilis with a crab spider sitting in it, just having its lunch, in reflected ultraviolet photography, using my "work horse" UV filter, the Baader-U filter, as well as my XBV6 filter for simulated bee vision. Lens was a CERCO 94mm quartz fluorite lens. Light source was sunlight. All shots were done at about f5.6. Today more about how the sun sees us and how bees might see us in UV. 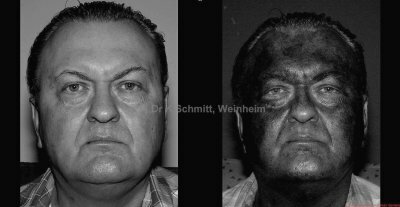 Well, in other words: how does human skin look like in reflected ultraviolet (UV) light compared to normal human vision. After shaving every morning, I usually apply some day cream to protect my skin. Shots were done inside using a modified for UV Xenon flash. A UV capable lens was used for this. All shots were done at about f5.6. So, the sunblocker in my daycream obviously has protective effects, clearly visible by the darkened skin. This shows that the used cream absorbs dangerous UV-B and also UV-A radiation (the latter being important to protect against the so called "white" skin cancer). Further its gets visible, that the reflected UV image clearly shows otherwise invisible freckles, about which some dermatologists say that it is skin damage getting visible, caused by the accumulated UV radiation exposure over the years. So whenever you're out in the sun, protect your skin! To summarize, I would say that reflected UV photography is a very suitable tool to make all that so nicely visible! I have written about that HERE before.